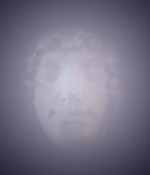 Janet will be attending the Psychic Faire at Celestial Circle this December 2014 – Call 727.785.1960 for appointment or just stop in. Janet will be at The Villages on Friday, December 5, 2014, giving messages. This event will be held at the Recreational Center. The Villages is located southeast of Ocala next to Lady Lake. This should prove to be a magical event with the moon full on Saturday. 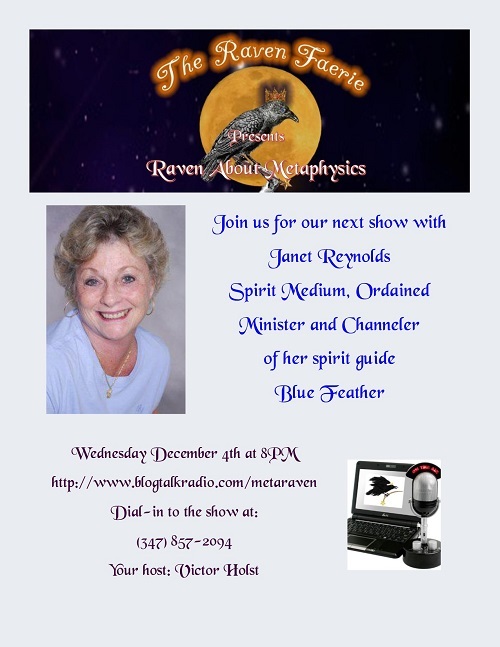 Meet and Make a Connection is proud to offer you “An Evening with Spirit” in this one night only Gallery Presentation by Spirit Medium Janet Reynolds and her Spirit Guide, Blue Feather. Do you feel that your angels, guides, or loved ones in the spirit world are trying to connect with you? Well, you are probably right and your opportunity to hear from them with even greater clarity in a private group gathering where spirit messages will be brought through with the help of Janet Reynolds , her spirit guide Blue Feather, and your own spiritual support team. For a night of divine communication, simply mark your calendars for “An Evening with Spirit”, brought to you by Trinda Latherow, author and founder of Meet and Make a Connection, an inspirational mind, body, spirit blog community at http://www.trinda.net/blog. My name is Janet M. Reynolds and Blue Feather is my Spirit Guide. He is from a long time ago and a strong and good warrior of the light. When we do readings we are tuned into the present day. We try to give information that is exceptionally helpful to the individual. We relate to the power of now and for the future. Words and symbols are given to give a greater awareness of situations. We concern ourselves with how we explain our thoughts and visions to everyone. Questions may be asked and answers found with an open mind. 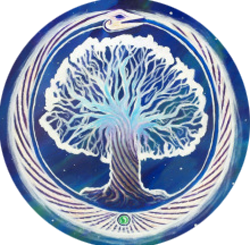 All messages are presented by Janet Reynolds and Blue Feather, your guides to even greater enlightenment and personal peace. Janet is starting back up at the Friday Market located at the Treasure Island Community Center Park. Janet will be at Benjamin’s Studios for readings Saturday, September 28, 2013 from 11:00am to 4:00pm. 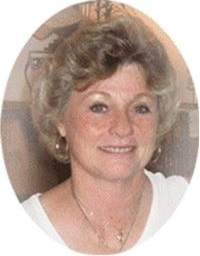 Janet is going to be in Palm Harbor on Friday, September 6, 2013, 2013 at Celestial Circle. You can catch her there from 10 am to 4pm.